The large painting of a stag, which is also on show for the first time in London since 1983, has been loaned by the National Galleries of Scotland, who acquired the work in 2017 following a public fundraising appeal. The picture will be the centrepiece of an exhibition that will reveal the close connections between Landseer (1802–73) and the National Gallery. While The Monarch of the Glen is usually associated with Scotland it is less well-known that it was originally commissioned for the Houses of Parliament in Westminster. Sir Charles Eastlake, the Gallery’s second Keeper and later first Director, was closely involved in this project. The painting was first exhibited at the Royal Academy in 1851, which was then housed in the National Gallery building. Landseer designed the lions for Nelson’s Column in Trafalgar Square and the exhibition will also include paintings and drawings connected with these famous sculptures. A representation of the painting made in 1966 by former National Gallery Associate Artist Sir Peter Blake will provide a living artist’s response highlighting 'The Monarch of the Glen’s' enduring appeal. Here's what Sir Peter had to say about both his painting and the original at the time of its sale last year. 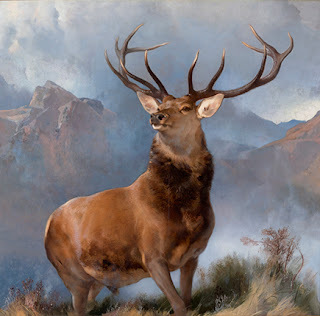 Landseer’s The Monarch Of The Glen will be on display in the National Gallery in London from 28th November 2018 – 3rd February 2019, Admission free.